Theme: No one wants to be labeled and to be placed in a 'box' yet we can be all prejudice/ one-sided. Conscious or unconscious. Over 100 artists from various countries have responded and with maximum two postcards submitted. Surprising are the diversity, materials and perspectives. There are cards that make you laugh or wonder what they have to do with the theme, but also that make you think. Grateful for the large number of submissions, we are aware that it is a theme that lives with many people. And they were prepared to make a statement on this matter and share it with the world. In this exhibition you will see the individual approach and imagery of both artists on themes such as faith, heaven and universe. Interesting about the exhibition are the different" tracks" that the artists walk. Religion always leaves its mark on people behind both unnoticed and clearly visible. 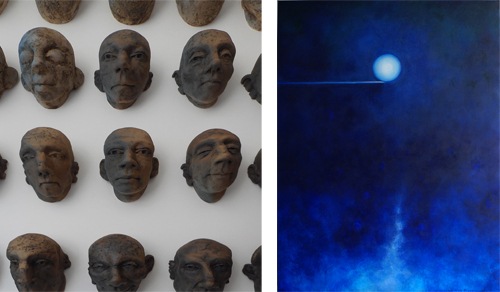 At the moment, the ceramic heads of Arjen Markenstein plays a prominent role in his work. For example, he is currently working on the project 365 days 365 ways, a collection of 365 heads that will emerge in the course of time. Everyone believes in his own way and has to decide every day whether he still believes in what he took for granted yesterday. Be surprised by the diversity of heads, all unique. Yvonne Rooding her work is about life itself. The extent to which this takes place is irrelevant to her because she uses the universe as a metaphor and thus connects worlds. This way people can influence each other, but planets can also have the same effect. These connections are, as it were, energetic traces both visibly and invisibly depicted on her deep blue canvases. 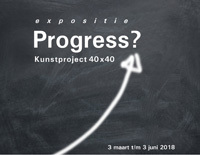 Now the 4th time Galerie Tuur organizes the artproject 40 x 40. 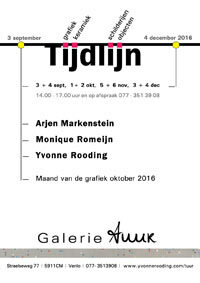 Simultaneously with the current exhibition of Arjen Markenstein with sculptural ceramics and Yvonne Rooding with paintings. 9 artists can participate, each work has the dimension 40 x 40 cm and with the theme Progress?. 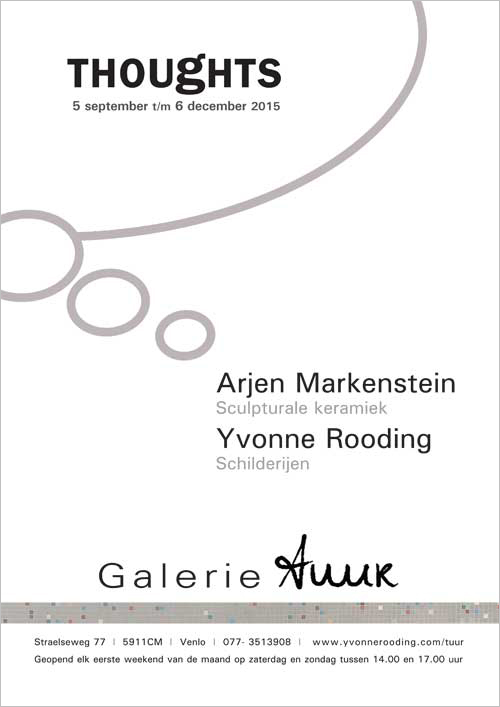 The latest work of Yvonne Rooding (paintings) and Arjen Markenstein (ceramic sculptures) can be seen. 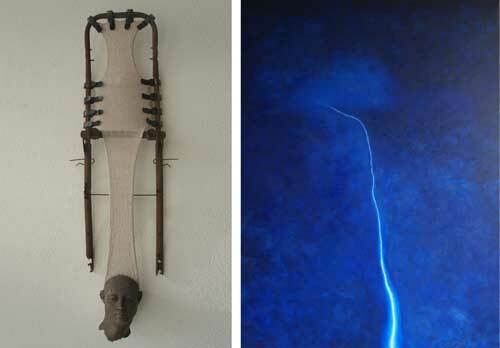 The two artists exhibit their work under the name Jump. 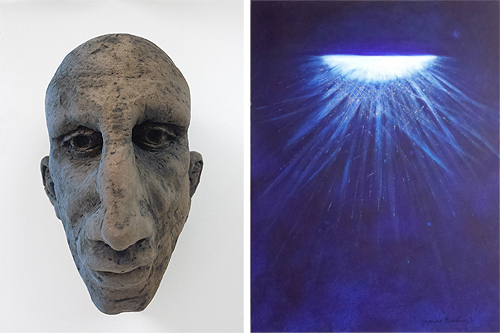 You can see the exhibition individual approach and image language of both artists on themes such as religious experience, heaven and the universe. Interesting to the exhibition are the contradictions in approach to these themes. Each work begins with a leap of faith. A whole process from nothing to something with all its uncertainties and challenges it involves. 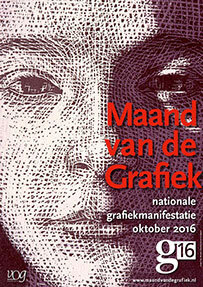 At present, the ceramic heads of Arjen Markenstein play the lead role in his work. Not only in the well-known with oxides washed in clay but also stained with sinter-slips and combined with embroidery technique. He does not work on model, therefore it is not portraits. Let yourself be surprised by the variety of heads, all unique pieces. In the paintings of Yvonne Rooding, the infinite space of the universe plays an important role. Rooding imagines the universe from the human psyche, emotions and feelings. Recurring are the circular shapes that symbolize life itself. In the painting "Leap of Faith" she literally represented a leap of faith. The paintings are acrylic on canvas. The exhibition coincides with the art project 40 x 40. 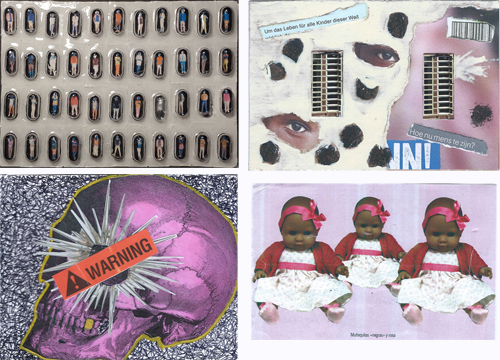 9 contemporary artists have a stage to one with 2 dimensional work of this format to exhibit. The work is of course thematically with ' Secret '. Each artist his own "secret". Opening march 5, 3.00 p.m. Opening oktober 1, 3.00 p.m. Skin in the lead role, how it looks or what is underneath. 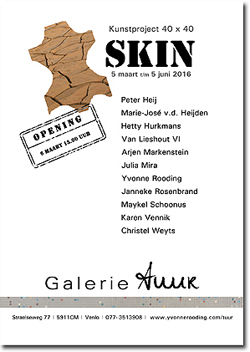 The skin texture is at Arjen Markenstein visible in his sculptural ceramic work. The rawness of the clay, which almost ruptured with which he seeks out the limits of the elasticity. Rooding works with many thin layers of paint and builds so the skin of her paintings on. the use of many colors over each other (largely blue) indicate the depth. They use this depth to the universe. As a shield around us. Also the skin of water inspires her. 9 contemporary artists get a stage to exhibit one 2 dimensional of this format to take part. 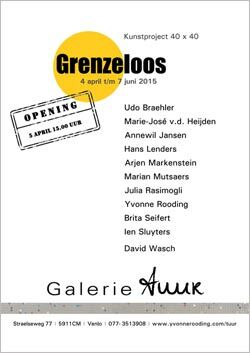 The work is thematically connected with the ongoing exhibition ' Grenzeloos ' by Yvonne Rooding and Arjen Markenstein. Yvonne Rooding sees life as a cycle, a continual alternation by which opposite attracts and rejects each other . These cyclic elements she translates them into circular shapes, to point out events in your life. A journey in mind, feeling and energy. Arjen Markenstein is inspired by Catholicism from the past where he finds his own contemporary translation, stripped of the specific religious meaning. He breaks through stereotypical thoughts, which he alternately, humorous, critical or cynical creates into a new sculpture.